A handpicked 15-piece set featuring sunscreen, safe self-tanning, and bronzing must-haves, plus a convenient travel bag. 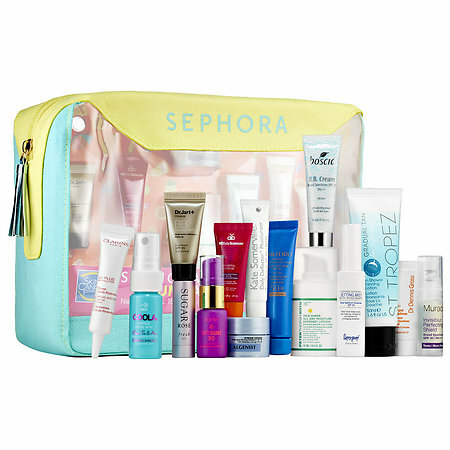 The 2017 Sephora Sun Safety Kit includes Sephora’s favorite sun care products that provide an array of sunscreen and safe self-tanning innovations for beautifully tanned, bronzed, and protected skin all year long. Sephora donates $20 from the sale of each kit to The Skin Cancer Foundation, the only global organization solely devoted to the prevention, early detection, and treatment of skin cancer. While skin cancer is the world’s most common cancer, it is also one of the most preventable, and is highly treatable when detected early. The mission of the Foundation is to decrease the incidence of skin cancer through public and professional education and research. Proceeds from the Sun Safety Kit support a variety of Skin Cancer Foundation initiatives, including the Sun Smart U youth education program, and the Go With Your Own Glow™ PSA campaign. A handpicked 15-piece set featuring SPF and self-tanning products to keep you protected from head to toe, plus a beach-friendly, reusable travel bag. This collection features SPF in different formats, including the latest innovations in sunscreens. From SPF primers to makeup setting mists to SPF lip and BB creams, these products deliver much more than just sun protection. The kit also includes safe sunless tanners for the perfect summer glow without the risk. All 15 pieces were handpicked to offer a summer of sun protection for face, lips, and body without greasy mess, white residue, or unpleasant smell—all in a super cute beach bag. I had really been wanting to try the MURAD Invisiblur Perfecting Shield Broad Spectrum SPF 30. I have been loving my little sample of it and using it daily, but the full size is $65 which seems insane for a makeup primer! I had already tried and loved the Supergoop! Defense Refresh Setting Mist SPF 50 so I was happy to get another sample of it. It’s also nice to spray on your neck and chest because it’s not sticky/oily/slimy. Update 4/19/17 it looks like they updated the mister on the full-sized product. The DR. JART+ Premium Beauty Balm SPF 45 has been fantastic I’m actually almost out of it already. The coverage is really nice and natural (but still gives you some coverage and it can be layered) and it lasts all day and doesn’t make me super oily! Love! It looks a little gray when it comes out of the tube like a lot of high SPF BB creams do, but on my face I don’t think it looks gray at all. The FRESH Sugar Rose Tinted Lip Treatment SPF 15 was already a favorite of mine from back when it was a free birthday gift at Sephora. It’s super moisturizing and has a nice tint to it and lasts a while. Don’t leave it somewhere hot though, it will melt! The ALGENIST Sublime Defense Anti-Aging Blurring Moisturizer SPF 30 is nice too. The texture of it surprised me. I wish it blurred a little more though. The Peter Thomas Roth Max Sheer All Day Moisture Defense Lotion SPF 30 is just ok for me. I wish it dried down more it just feels like very basic sunscreen. I was pleasantly surprised by the Tarteguard 30 Sunscreen Lotion Broad Spectrum SPF 30. It has a nice scent and felt good on my face. The Kate Somerville Daily Deflector Moisturizer, Broad Spectrum SPF 50+ was just ok to me. Too thick and sunscreen-y it doesn’t melt and disappear into my skin like I want sunscreen to. Update 4/19/17– I actually found the Coola Makeup Setting Spray SPF 30 at Marshall’s for $20 which is a great deal, but I still prefer the Supergoop! version because the Coola one is quite sticky. If you’re interested in the Sephora Favorites Sun Safety kit definitely buy it ASAP because it will sell-out soon and it’s limited edition! 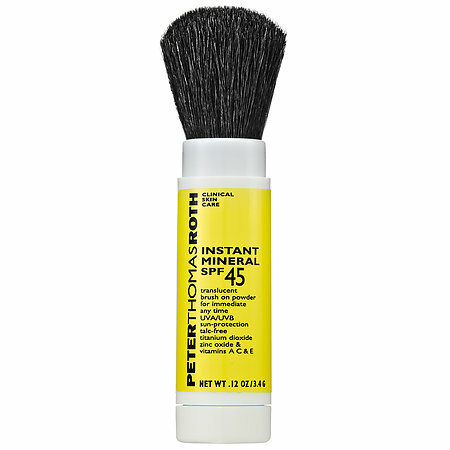 The other SPF product I’ve been obsessed with and use daily is the Peter Thomas Roth Instant Mineral SPF 45. this is a really cool product because it’s powder sunscreen that comes loaded in a brush. That’s right, no melty goopy messes or waiting for sunscreen to dry! I love using this for my neck, chest, shoulders, arms, and hands right before going outside. I also try to put it on daily before driving home. I love it because it feels like nothing on the skin and the powder is transparent! Tip: When wearing high SPF and/or lots of makeup be sure to DOUBLE CLEANSE your skin before bed. That means wash your face twice. You can cleanse first with a makeup wipe/remover, an oil cleanser, or a cleansing balm, then be sure to use some kind of actual facial cleanser and rinse well. I follow-up with a toner on a cotton pad to get off every last bit of dirt, oil, sunscreen and makeup so I’m squeaky clean before bed. This will help prevent SPF from breaking you out! Always Wear SPF- No Matter What!! Finally, don’t forget that you always need SPF daily no matter how overcast it is outside! Protecting your skin is so much cheaper and easier than trying to fix wrinkles from sun damage! Please also check out my I Didn’t Think I Would Get Skin Cancer Either post.